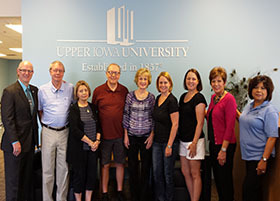 The Henry George Mackintosh Foundation has provided a $30,000 endowment for the establishment of the Martha M. Moeller Scholarship Fund at Upper Iowa University. The Houston-based Foundation includes directors Pete Mackintosh and Rob Mackintosh, sons of Henry Mackintosh and grandchildren of Martha Moeller, who attended UIU as a student in the 1890s. Rob Mackintosh noted his initial e-mail to UIU was a request for assistance in researching the history of his grandmother Moeller’s attendance at UIU circa 1897. He credited UIU staff members for responding promptly via e-mail and telephone with a brief amount of historical information about his grandmother’s attendance, scholarships, and endowments. The information provided to the Mackintosh family allowed the process of establishing the endowment progress more smoothly. “President Duffy, Andrew, and all of the staff at both the Fayette (Iowa) and Mesa (Ariz.) centers have been very helpful, responsive, gracious, attentive, and excellent communicators throughout the entire process,” added Rob. Rob explained that even though his grandmother missed a lot of school time during her childhood, Mattie managed to get the necessary amount of education to teach school. Mattie taught country school for four years from approximately 1896 to 1900. She sometimes boarded near the school, sometimes utilized a horse for transportation, and lastly purchased a bicycle that she rode seven miles round-trip, when the weather permitted. “It is enlightening to the Mackintosh family to learn that education played an important role in our values dating back to over 100 years,” noted Rob. The Henry George Mackintosh Foundation was established in 1994 by Pete Mackintosh in honor of his parents, Henry and Fran Mackintosh, to further belief in the value of an education. In its 21-year existence, the Foundation has donated approximately $150,000 to over 30 qualifying organizations. The criteria for the Martha M. Moeller Scholarship will be officially established in the near future. The scholarship will be renewable to any student, as long as the recipient continues to qualify under the specified criteria. Endowed funds, now in excess of $3.4 million, reduce Upper Iowa University’s tuition dependence and enhance revenues on a consistent and predictable basis. Endowed funds further promote the university’s diversified revenue model. As part of this investment in UIU students’ college education, Upper Iowa offers a wide variety of institutional aid through scholarships for the Fayette campus, UIU center locations and distance education programs, transfer students to the Fayette campus, international students, as well as other scholarship initiatives. Scholarship availability keeps an Upper Iowa University education affordable, accessible, and helps all students graduate with less debt. Approximately 150 scholarships are awarded each spring alone as part of the annual UIU Scholarships and Awards Banquet. A full list of endowed scholarships is available at http://uiu.edu/admissions/scholarships/list.html. For more information about how to endow a scholarship, please contact the UIU Office of Institutional Advancement and Alumni Development at alumni@uiu.edu or 563-425-5388.